Analyst Gene Munster and his team at Piper Jaffray pitted Siri on iOS 7 against Android's Google Now in a barrage of new tests, and found that the two competing personal assistants are about even in terms of performance. Both were given a grade of "C+." 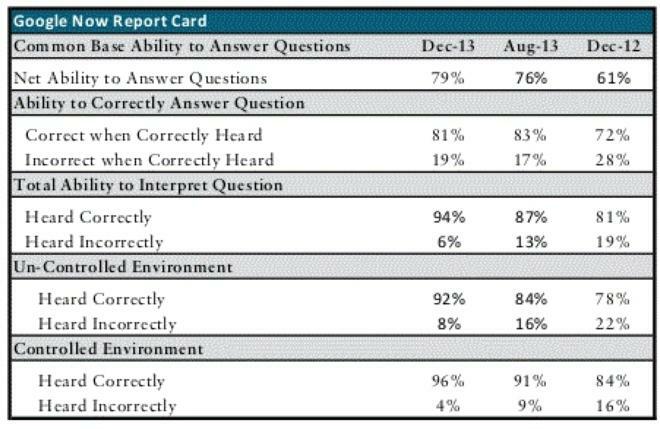 That was a marginal improvement for Siri, which earned a grade of "C" last year in iOS 6. 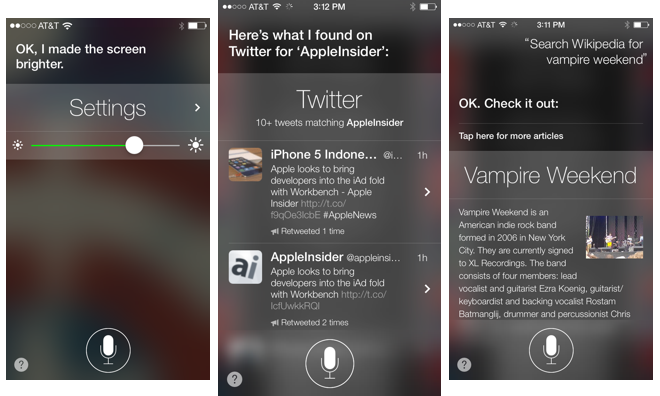 With a check of 800 queries, Munster found that iOS 7 has improved Siri's ability to translate speech better in a noisy environment, with accuracy increasing from 83 percent to 94 percent. 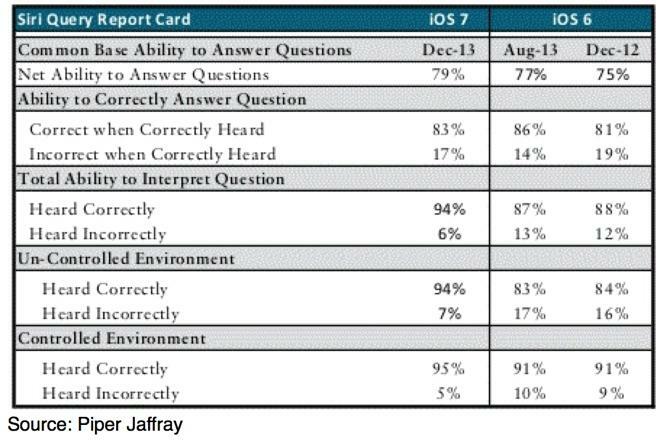 The tests also found that Siri in iOS 7 has an improved ability to answer questions, with accuracy improving slightly from 77 percent to 79 percent. iOS 7 has also further reduced Siri's reliance on Google for delivering data to users. While last December, Siri relied on Google for 27 percent of its data, according to tests by Piper Jaffray, Google now provides just 4 percent of Siri data, having been replaced largely by Microsoft Bing, Wolfram Alpha, and Wikipedia. As for Google Now, its grade improved more significantly, from "D-" to "C+," with major improvements in comprehension and accuracy. In particular, Google Now's ability to understand users in a noisy environment grew from 78 percent accuracy in December 2012 to 92 percent in December 2013. The tests show that Siri is still slightly more accurate than Google Now when both services correctly understand the user's query. While Siri has an 83 percent accuracy rate, according to Piper Jaffray, Google Now provided the correct answer 81 percent of the time. Still, Google Now's ability to correctly answer a question saw significant gains in the last year, growing from 72 percent accuracy to 81 percent. In the same period, Apple's Siri went from 81 percent accuracy to 83 percent. In terms of total effectiveness, both Google Now and Siri are in a dead heat, with 79 percent accuracy rate in understanding queries presented by Piper Jaffray tests. As a result, both platforms were graded as a "C+" as of December 2013.